FC Bayern München return from UEFA Champions League exploits looking to maintain their five-point lead at the top of the table when they travel to 1. 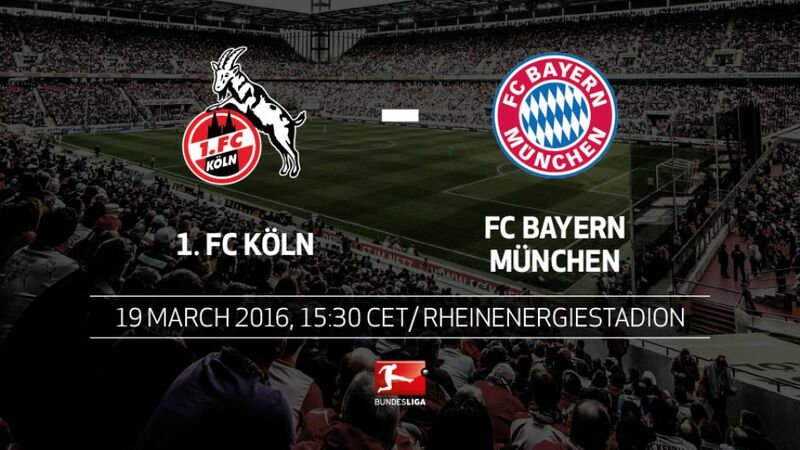 FC Köln on Saturday (kick-off 15:30CET/14:30GMT). Pep Guardiola's side remain five points clear of Borussia Dortmund at the top of the table, having returned to winning ways with a 5-0 victory over SV Werder Bremen on Matchday 26. The champions are still weakened in defence, however, with Jerome Boateng, Javi Martinez and Holger Badstuber all still sidelined with injury problems, and will be mindful of making any slip-ups that could let Borussia in. Meanwhile, Köln ended a four-game winless streak last weekend with victory over Hannover 96. The win was also a first clean sheet since November, a return to the sort of defensive stability the fans have been used to seeing under Peter Stöger. Keeping Bayern out will be another matter, but the Billy Goats are well placed in ninth with a nine-point cushion between themselves and the bottom three. Köln have lost three of their four home games in 2016.The Billy Goats have scored just 12 goals in 13 home games this season.Bayern have won all of their last five games against Köln, scoring 17 goals and conceding only two.The champions have played seven Bundesliga games directly after a UEFA Champions League fixture this season, and have won all of them.Thomas Müller has scored just five of his 19 goals this season away from home.Leonardo Bittencourt has scored three goals in his last two games.